If you know me, you will know that I love New York. It is one of my top 5 Cities around the world and currently is in the top spot! When one of my friends mentioned that she would be jetting off there to work for 3 months, I thought of just the right sort thing to give her as a going away memento and as I love papercutting too, its the right combination of fun. I love the Guggenheim building as it is just so different from alot of the buildings of New York, no highrise or square boxes to be seen here, It really was the foresight of the architect Frank Lloyd Wright, that meant it is such an iconic building now! I bought this book when I last visited in 2006 from the Guggenheim itself - of course. The first time I went to New York was with Sammy in 2004 and we went in to see it but didn't go around any exhibitions. The last time I made sure I walked around the huge curve that houses most of the museums galleries. So what better building to use as my inspiration for a bit of papercutting for a card to send away with my friend to remind her of home. This is such a simple project and only really takes the time to work out the way around you want the picture to be. With papercutting you can draw on the back of a picture to give you guidelines but you do have to remember it will be in the mirror image. So if you want something a certain way, draw it the opposite on the back. 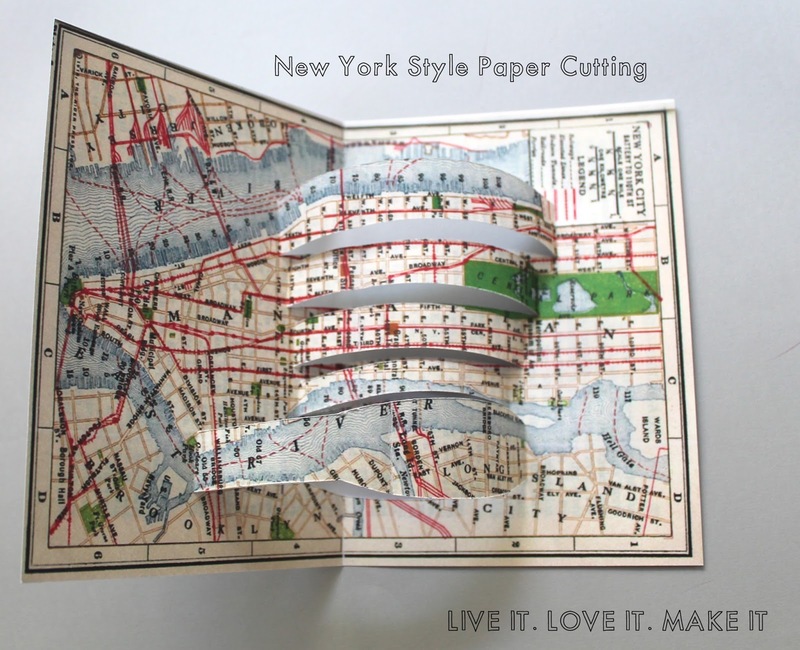 You will need: Card (I used an old map of New York that I printed), Ruler, Cutting mat, pencil, rubber, Craft knife/scapel. Start by using a reference picture of what you want to cut, or draw your own - depending on what you are going to papercut. Then start drawing on the back of your card, remembering to do the mirror image if you want it to be a certain way. You could choose to do a tester piece and so you know you are doing the right thing when you come to your final piece. Then start cutting along the lines - remembering to make sure your drawing is still attached. On my version this meant only cutting the horizontal lines. I then folded my card in half so that it will fit in an envelope. I bent the horizontal lines into the inside of the card, so that the cuts protrude out when the card is folded. Then I used a pencil to curve out the cuts so that they have the lovely curve of the Guggenheim when the card is kept slightly bent on the mantelpiece. Then, that's it done, quite simple really. The best thing about papercutting is that it really can be so simple to look effective. There are so many different styles to try and so you can start small and work your way up. I find it better to draw on the back as it gives a cleaner finish in the end, but you might want to start with keeping it the same way and so you can practice the mirror image after you have mastered using a scapel, especially for those little bits. Trust me, there will always be a little bit that just rips off almost when you have finished! We would love to see if you have a go at any papercutting. Like with all our DIY's if you do, take a quick pic and share it with us on Twitter or Instagram don't forget the hashtag #livelovemake. Hope your having a lovely Monday! This looks really awesome! I've been loving paper cutting/art recently too with my Graded Unit at college revolving around the whole thing I've been obsessed! Thanks Lauren. Yes papercutting is so addictive, right! Our 500th Post & OMG! We are in Mollie Makes!